I love all the number above “24” that still remains dark gray! Super fun card to make – and you can make it a birthday card for all the different ages, or even letters with a single word on the bottom. This will be entered into Simon Says Stamp Clean & Simple challenge. Super fabulous! I love how you randomly placed those numbers. The pink “24” is perfect! So glad that you could join in the fun this week at CAS-ual Fridays! Love this idea! My number dies will be coming out today! This is an instant favorite! I love how the pink numbers just pop. Brilliant! Thanks for joining us this week at CAS-ual Fridays! Genius idea, Pamela! i love this! Okay, now that’s just pure genius! And so, so adaptable. Thanks for the fabulous inspiration. You’re quickly becoming one of my favorite designers. I’m squealing I love this so much! I LOVE this! What a FUN idea!!! Um…WOW! This card is phenomenal! I love everything about it! Thank you so much for playing along with us at CAS-ual Fridays! This is beyond amazing! Oh to be 24 again! I love, love, love your card! Thanks so much for playing with us at CAS-ual Fridays! I love everything about this card! Just perfect. Oh my goodness! How clever and creative and inspiring! I saved it to my CAS Pinterest board and I love the idea – perfectly executed. Have a wonderful day! Wow, this is so cool! Not only are the numbers great looking but loving the colors you picked. Such a cute and clever card. I can’t believe how young you and your friends are! But, you are right–this would work for any age, and in any color scheme. I’m pinning for future casing! This is such a great card! So simple, yet elegant and fun! I love the color combo as well. UBER creative! Love the use of diecut, colors and gems! Thanks SO much for playing with us at CAS-ual Fridays! This is fantastic!! So creative, love the dramatic black here! Thanks for playing along with us this week at CAS-ual Fridays! Superb! I absolutely love this design! I lOVE this, gorgeous, congratulations on your win. YAY! Congrats on your BIG win over CAS-ual Fridays! Well-deserved honor, Pamela! This is amazing! Congrats on your win @ CAS-ual Fridays! Wow, this card is amazing, no wonder you won over at CASual Fridays! I will definitely be trying to replicate this!!! super card! I love it. congratulations. Excellent card! Love those random numbers!! Congrats on your win! So creative. 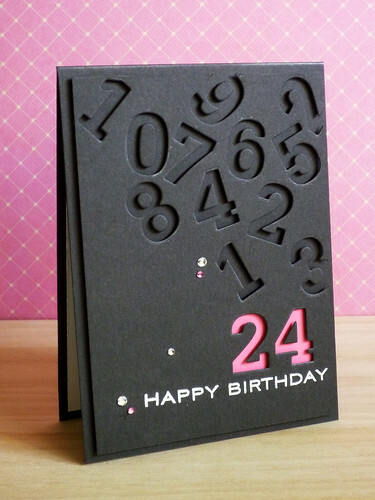 Love your card and the spotlight on the “24”! Congrats on your CF win! Congrats Pamela. A well deserved honor for sure, your card is so stinkin’ clever! Love it! Oh my! This is amazing. You wouldn’t if I pinned it, would you? How can I make this card? ASAP! Had to give this a try as soon as I saw it. Adorable! Wow! This card is amazing! I’m so glad I’ve found out your blog! Have a nice and blessed day! I love this Birthday card! I am new to crafting. Can you please tell me where I can purchase the die numbers and alphabet. Ah this looks great, thank you for the idea!